When the folks at Nuun reach out to you about trying their new electrolyte drink, you say "yes please" and then thank them graciously when the package arrives. from his trip to Bali last year. Now, I've gotta be honest with you - I am a HUGE water lover. I could (and often do) drink the stuff morning, noon and night (which can lead to frequent bathroom breaks - oops) and never get sick or bored of it. With that being said, I am well aware that often times one needs to replenish the body with more than just water. Seeing as I have a deep affinity for water, I've never really searched out an alternative hydration plan. Most of the time I just reach for old fashion agua or whatever (low calorie) sports drink was on sale that week at the grocery store. I've gotta say, Nuun takes some getting used to (at least for me). It isn't like BAM full-of-flavor like some of the other sports drinks on the market AND it's carbonated, but having a clean way to replenish your body with electrolytes is AWESOME! I know some of you are already Nuun lovers, while others of you may have never tried it before. Whichever category you fall in to, let me tell you, do I have some news for you?! Nuun is releasing a NEW product (okay, maybe not a completely new product, but a tried and true product that has been updated to a new and improved formula!)! New Nuun Active has the same optimal electrolytes, but now has a better absorption rate and with plant-based, natural ingredients. It is also certified gluten free, certified vegan, and certified for clean sport through Informed Choice. One of the biggest differences between the current and new formula is the switch to plant-based sweeteners (monk fruit and stevia leaf extracts instead of acesulfame potassium) and to natural ingredients. New Nuun is also certified vegan (previously only some of the flavors were vegan). They've added 1g of non-GMO dextrose, which means calories are slightly higher than the current Nuun, but it improves the absorption rate and is still low overall (12 calories per 16oz). New Nuun is currently available at a few retailers including Whole Foods (ha, I bet some of you Nuun-aholics didn't even notice, did ya?! ), but will be available more widely in early February when it will be available at Nuun.com (at that point all retail locations will make the switch to the updated formula). Nuun has graciously offered up TWO 4-packs of the new Nuun for my readers! Yup, win it here before you can buy it from the site - AWESOMESAUCE! Use the Rafflecopter widget below to enter (and just a heads up - some of the entries are available DAILY so make sure you enter early and often!). This giveaway will run through January 31st at 11:59pm. The winners will be contacted via the email address associated with their Rafflecopter account and will have 24 hours to claim their prize. All entries are verified, so please be sure to complete them or a new, random winner will be selected. Good luck to everyone who enters and #MakeYourWaterCount! I love using Nuun after a workout, but sometimes plain ole' water is perfect! I currently hydrate post run with Nuun Kona Cola but would love to try new flavors! I have never heard of these! I hydrate after a run with just water! I've stayed clear of most electrolytes drinks because of fake chemicals but now I'm intrigued! I have never used Nuun but would love to try it! Post workout or long run, I stick with just water most of the time or chocolate milk, if we have it. I haven't used NUUN I'm a while, but always liked the flavors!! I drink Nuun after 5 miles or more of running. If I run less than 5, I really don't find I need anything other than plain water. I currently just use BCAAs or sometimes gaterade after a long run! I'd love to try Nuun though!!! I just tried Nuun and I am excited about the new formula! Would love to give it a taste. Nuun is the best! Watermelon is my flavor of choice! I could say I ton more about it and all the benefits I get from it for days! Water during the run usually unless it's longer than 13 miles and then will use some gatorade. Nuun always after the run. I love NUUN! I also like to drink coconut water. I hate water, hydration is a huge struggle for me!! I absolutely love to drink Nuun! I love that bit of pizzazz to my water! I am a Nuun girl! I use it all the time, during my runs, after my runs, and daily. I love using Nuun as an alternative to water. It's such a light flavor and the bubbles certainly are a plus! Never heard of these and I hydrate with lemon/water... thanks for the chance to win! I'm a big Nuun fan! Nuun is the only thing that doesn't upset my stomach during a long run, so I use it before, during, and after! I am currently a Gatorade girl (when I actually have it on hand) I have been interested in trying this Nuun everyone talks about though!!! I've always wanted to try Nuun. I just use water to refuel, so I'd like to see if Nuun would make a difference in recovery. I love Nuun! I refuel with Nuun, water, or seltzer. I love nuun!! I'm currently enjoying some cherry limeade with my lunch! Thanks for the giveaway! I LOVE Nuun!!!! Grape and Cherry Limeade are my faves! Nuun keeps me going, especially during the hot humid summer here in the South. I'm a NUUN girl through and through, but I have not tried the new formulation yet. Can't wait! I like the energy I get using nuun post workout over water. Typically Skratch - never tried Nuun, but I've heard good things! I usually stick to water, occasionally powerade when it's extra hot out during a run. Would love to try Nuun as an option! I use nuun before and during my workout. I love the stuff. I love Nuun! It's hard to pick a favorite - probably cherry limeade! I usually stick to plain water but after an especially long run or hot summer run I'll add an electrolyte replacement. I've tried GU electrolyte tabs and SOS. 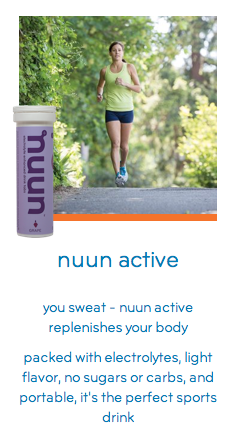 I would love to try Nuun. I gave Nuun another try yesterday after a long run & it was a successful try! Never heard of this until recently. Looks yummy. Worth a shot! I hydrate with NUUN of course!!! I love the cherry limeade flavor! Lately I've just been hydrating with water, but I used to drink Nuun on group runs. It was perfect during the hot, humid summers! Oh my I've been wanting to try these!!!! I currently rehydrate after workouts with plain 'ol water. I love nuun after a workout or a long run. I've always loved Nuun! Great products, thanks for your review! I just recently tried Nuun for the first time and now I'm hooked! I learned to drink it post run though because the small amount of carbonation makes me burp lots. Excited the new active favors are certified vegan as I've switched to a vegan lifestyle, also excited to try some more flavor a! Nuun electrolyte tablets have been my go to for hydrating before, during, and after workouts since I discovered Nuun during a varsity track and field camp in Arizona. Lime is my favourite. Perfect for a hot day. I trained for my first marathon last year and am beginning to train again! I love nuun because it has no sugar or carbs but it replenishes all the electrolytes I sweat out and I sweat A LOT. I'm so in love with nuun tropical tabs! I use Nuun! I love the Active flavors for during a long run, and the Energy flavors for before! I'm like you, plain old water is good enough for me. I hate super sweet things which is why I love nuun. The flavour is subtle and not too sweet which is perfect! I love nuun. I drink a lot of water and occasionally like to mix it up so I drink Nuun All Day! I would love to try the Active flavors. I usually use Nuun - pink lemonade is my favorite! Somehow on hot summer rides I'm always craving lemonade, and Nuun gives me a way to enjoy it with out all the sugar. I like to use the lemon lime Nuun after a long run. I have always and will always be a fan of water. And the moment I found nuun, my water just got better. I drink it all the time. It's nice to mix it up some and have some flavor in there every now and again. Especially without any added sugars. I'm a nuun girl for life. I looooove NUUN. I have it at my desk and at home for hydration throughout the day and after a workout. I love Nuun! It is a great product to sip on daily when I need a little oomph in my water or to drink the day after a long run to replenish. I currently hydrate with water & juice. Still looking to perfect my hydration and nutrition before and after runs. I always have a bottle of chocolate milk ready after long runs, then a good amount of water. I love Nuun for during my marathon training runs. I love Nuun but hate the taste of stevia...fingers crossed the new formula doesn't taste like it! Gonna need more nuun as my mileage increase! I get and stay hydrated with Nuun Active and Nuun All Day. I like to make my Nuun the night before a run so it's flat for my long run. I usually drink water after exercise but struggle with drinking enough throughout the day. I love nuun for that reason...yummy no-guilt excuse for staying hydrated! I have always wanted to try Nunn. The citrus and grape sound yummy! Nuun Energy Cherry Limeade is my favorite flavor. I could drink this every day, all day! I hydrate a little before during and after wtih either plain water or some Nuun! I love their product and would love to try some new flavors. Love Nuun! It's my go-to for hyrdration. I currently use glacier cherry (the white bottle) Gatorade - not the best chemical wise and sugar wise, but I know it works with my fickle stomach. Nuun, of course! My favorites are citrus and strawberry lemonade. I LOVE Nuun! Only way I hydrate! Have always been tempted to try Nuun, it's awesome to see an honest review! I often forget to drink enough after a workout, but I try and drink a glass of either Nuun or Gu Brew and a glass of water because I don't really drink while I'm running. NUUN! Yes! Watermelon... is my fave! Water is usually my choice and coconut water. I've tried Nuun once at a fitness expo and it was pretty good. Love using Nuun to hydrate - grape is my favorite! I tried Nuun for the first time in December and while I LOVE it, I didn't use it for marathon training because I read that it didn't have any carbs or sugar, which you need on marathon training runs, in my opinion. I use Nuun for hydrating in general. It jazzes up boring water and I actually feel better afterwards. I like using it before and after runs, but Gatorade or other sports drinks during. 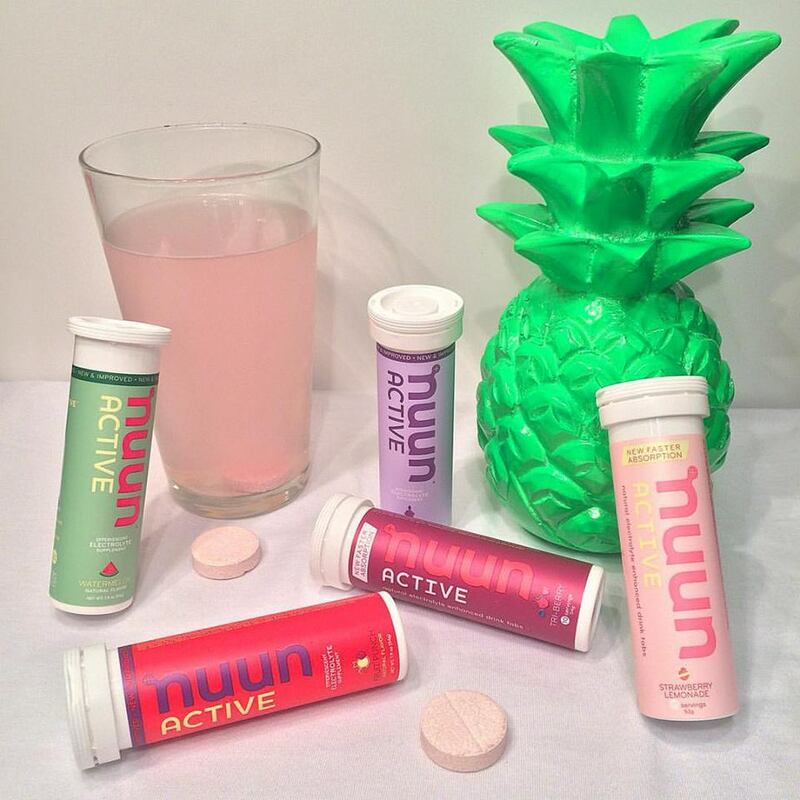 I love using Nuun before and after my workouts to get my hydration on - Strawberry Lemonade is one of my favorites! I actually drink Nuun! I didn't realize that some of the flavors weren't vegan. I am totally a Nuun girl. Finally tried my Nuun plus during my half yesterday. I'm a nuun addict! I'm not a big water fan, but nuun tabs really help me stay hydrated all day!! I usually hydrate with water or Gatorade, but I've heard amazing things about Nuun and am willing to give it a try. Nuun is the greatest! I love this stuff, I find empty tubes of it stashed everywhere from my car to my gym bag. you know those memes that have been going around...there should be one that says "steph doesn't hydrate. don't be like steph." I love Nuun! I'm guilty of never drinking enough water, so adding these tablets helps! I used to only drink water before, during, and after my runs. Until I discovered Nuun! I am not a huge fan of Gatorade or Powerade because of the calories so Nuun is a perfect happy balance! Love the Nuun energy (tri berry flavor)!!! I also am a water lover and drink it all day long, but I discovered Nuun last year and love it after a long run. I think it helps me feel less dehydrated sooner when I'm naughty and forget to carry water with me! Chocolate milk post-run but grape nuun during. Can't wait to try the new formulas! I'm already a huge fan of Nuun! I have at least five tubes at home right now and enjoy before, during and after my workouts. I love nuun or the maui & sons brand of coconut water. Really not sure why I've never tried Nuun, keep hearing everyone rave about it. Love the sweetener switch. Currently use coconut water. I love using the Cherry Limeade Nuun! So good! I have never tried Nunn but would love to. 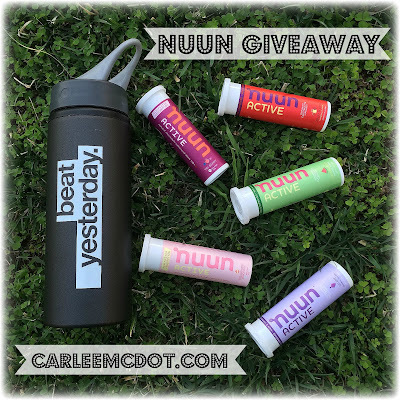 I have recently tried Nuun for the first time, love it... Would love to win this to try new flavors! I usually use regular water for workouts, if I know I will be sweating a lot I love to use Nuun! Cherry Limeade energy is the best!! Watermelon Nuun is my jam! Nuun is my go to hydration! I use nuun when I run and during the busy time at work the nuun energy to keep me going all day! Excited to hear about the sweetener change! I use Nuun exclusively, it is the best! I love to use nuun after long runs! Love nuun been using it for awhile now. Beats every drink on the market. Nuun is the best! I need more in my pantry. I currently hydrate with only water, but have tried Nuun before and love it! I just don't buy it regularly! I like coconut water, but would love to try something different for hydration! I LOVE Nuun, especially strawberry lemonade!! I've never tried nuun before but I would love to!! currently just water but during the summer months i am all about using Nuun before and after my runs. I have never used nuun but I love carbonated flavored water so this is probably something I would enjoy! I have been using powerade for my long runs... I'd like to try something different though! I keep a bottle of water in my car for after my long runs, and plop a nuun tab in right after to rehydrate after a run! I'm already a Nuun lover! It's the best! I love Nuun!!! My tummy has issues with lots of stuff on the market, but never had issues with Nuun.....I swear the carbonation helps. I usually carry around a half liter bottle and have it filled and drink before, during, and after my cardio. I have never tried anything like this but I have heard great things about them. I usually just keep hydrated with water or an electrolyte drink! Nuun is the best for reducing my leg cramps after long runs. During the hot summer months where you are pouring buckets of sweat, you CANNOT live without Nuun. It really is a life saver. I love plain ole h2o, but I recently bought a tube of Nuun and it is really great! I drink a glass of Chocolate Milk. I love nuun! I use it as well as Vega for my hydration and recovery after a run. Lately I've been going old-school and having a small gatorade after workouts. I'm typically just a water (sometimes Gatorade, etc.) person, but I've heard a lot of good about Nuun that I'm excited to give it a try. I drink some nuun (cherry limeade is my favorite) then some beer! I drink Nuun after every run! Nuun is the only way I hydrate after a run! Love my Nuun! Pre workout in the morning I like Nuun Boost. I love Nuun because it replenishes what I've lost during a run/workout without raising my blood sugar. It wil be interesting to see if the new formulation will work the same. I drink chocolate milk after my long runs. For shorter runs, just water or Nuun. I use Nuun Active lemon lime or just water. Depending on the intensity of the run, I will rehydrate with water, Nuun or chocolate milk. And there's always the possibility of a mimosa for some social fun after a long run. I have been using DripDrop hydration packets. I love NUUN - Kona Cola is my favorite (boo to being retired!). I also like Gu Brew's chocolate smoothie after a hard run, too.